Simon Darcy is an interdisciplinary researcher with expertise in developing inclusive organisational approaches for diversity groups. His research has spanned a variety of contexts including sport, tourism, events, volunteers, transport, the built environment and disability services. Simon has held grants with the Australian Research Council, Sustainable Tourism Cooperative Research Centre, the United Nations, and has carried out research studies for government, business and not-for-profit sectors. Simon's work is characterised by a research evidenced based approach to changing business, government and not for profit sector practices. He is a member of the Disability Council of NSW, which is the ministerial advisory to the New South Wales Government's Department of Family and Community Services. He is currently working on a number of projects relating the National Disability Insurance Scheme, National Disability Strategy and person centred approaches to disability policy. 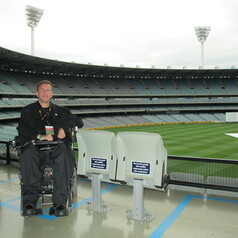 As both an academic and a person with a high level disability, Simon brings a unique insider's perspective to understanding disability issues and the rights of all people to fully participate in community life.